Remember Intel’s recent competition giving punters the chance to win one of its Core i7-8086K limited-edition processors celebrating the 40th anniversary of the first 8086 chip? 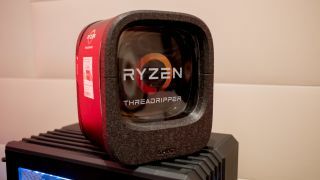 Well, in what could be described as a cheeky move – although Intel might use a stronger term – AMD is offering 40 folks in the US who scoop one of Intel's CPUs the chance to swap it for a Threadripper 1950X. The Core i7-8086K is a 6-core (12-thread) processor that's capable of boosting to 5GHz out of the box, the latter being the big selling point. However, AMD’s Threadripper 1950X is a 16-core (32-thread) monster which can boost to 4GHz, and retails at around $750 in the US these days (£670 in the UK, which is around AU$1,200), compared to Intel’s chip, which will set you back around $430 (£380 in the UK, around AU$680). So yes, AMD is firmly treading on Intel’s toes here, with the move to offer winners a swap to a beefier and more expensive chip, rather than, say, launching a competition of its own. It’s what you might call disruptive marketing (although again, Intel would probably use a stronger term). That said, while AMD’s processor may bristle with a much greater core count compared to the anniversary edition CPU from Intel, the latter is still clocked considerably faster, and, depending on what you’re doing, could achieve a better level of performance – despite the gulf in cost. The other consideration is that Intel’s chip is a limited-edition affair celebrating the big 8086 anniversary, so it could be worth something in that respect in the future. As we mentioned at the outset, this offer is only available to Intel’s competition winners in the US. And you’ll need to follow certain steps detailed at AMD’s web page here to facilitate the swap. AMD explains: “Notified winners of [Intel’s] Competitor Sweepstakes, subject to Terms and Conditions, may be able to exchange their prizes for a Ryzen Threadripper 1950X processor. So just be aware that it’s the first 40 people who get in touch and complete the necessary steps that will qualify for the swap, and also that your Intel prize must still be unopened in its box. AMD is certainly taking the opportunity to leverage everything that comes to hand against its main rivals, Intel and Nvidia. In terms of the latter, most recently that meant firing numerous volleys of flak at the rival graphics card manufacturer over its GeForce Partner Program – an endeavor that Nvidia eventually abandoned due to the negative publicity surrounding it.